After the release of the studio album “Doctor Faith“, Christopher Cross started one of his biggest tours in Europe in the last 15 years. 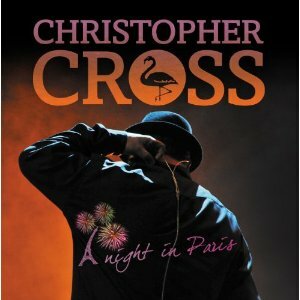 “A Night In Paris” is the first live 2CD/DVD by Christopher Cross, which was filmed at the notorious Theatre Le Trianon in Paris, France in April 2012. It will be released on April 8th, 2013 via earMUSIC. While the previous tours showed a more acoustic (at times even jazzy) approach, Cross decided that for the ‘Doctor Faith’ tour he would go back to his musical roots and expanded his band to include a more classical “rock line-up“: Andy Suzuki (keyboards, sax), Dave Beyer (drums), Chazz Frichtel (bass, vocals), Kiki Ebsen (keyboards, vocals), Richie Gajate Garcia (percussion) and famous sound engineer Ross Pallone (Michael Jackson, Alice Cooper, Elton John...). Filmed by 9 cameras in HD, the show captures Cross playing all his classic singles and new material from the album “Doctor Faith“. Christopher Cross’ impressive career started in 1981 with an album that is still considered one of the best and most successful debuts in the history of rock. His self-titled debut LP was instantly rewarded by critics as a “rock masterpiece“ and in only a few months, three tracks conquered the #1 worldwide (‘Ride Like The Wind’, ‘All Right’ and ‘Sailing’). Cross won 5 Grammy Awards in 1981 including Best New Artist and Best Song (‘Sailing’). The album cover displaying the iconic flamingo sold 20 million copies worldwide. Cross always made the quality of his music coherent and the artistic integrity was always top of his priorities. Album after album he kept delivering great song writing, soulful performances and a high level of musicianship. This way he “survived” the success with his original mix of rock, soul and blues, mixed with his sensibility and unique voice. Over the years Christopher Cross’ music gained the respect and appreciation of some of the best musicians in the world, as the list of his outstanding musical collaborations shows: Don Henley - Eagles, Michael McDonald - The Doobie Brothers, Brian Wilson - Beach Boys are just a few of the numerous artists Cross has worked with. One collaboration, which deserves a special mention, is the work with Burt Bacharach in 1984 for the song ‘Arthur‘s Theme’ for which he won an Oscar.